Clean and cut the eggplant into medallions. Turn the grill to high, and grill each side of the eggplant until tender. In a bowl, mix all the other ingredients until thoroughly combined. 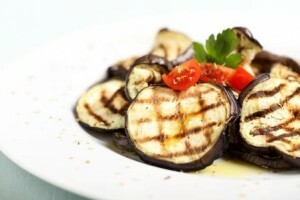 Remove the eggplant from the grill and pour the mixture over it.